Only accessible by boat, this is a hidden gem of The Broads. Peace and tranquility rule this place: the Nature Trail winds its way from the banks of the River Bure to the edge of Hoveton Great Broad. There are no boats on its waters, only wildlife. For more information about Hoveton Great Broad, the Nature Trail, and the Restoration Project, please visit their website, or find them on Twitter. Prices are for a return trip to the Nature Trail. 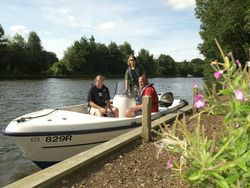 We also run many events in collaboration with the Hoveton Great Broad Nature Trail. Please visit our Events page for more information. Please note, dogs are not allowed at the Nature Trail.